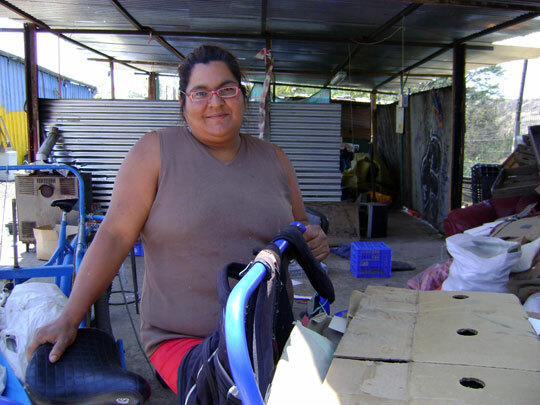 Karina Madariaga began collecting and selling recyclable materials at a young age to add to her family’s income. In 1999, she and nine others who made a living salvaging recyclables decided to a form a collection center called Oreste Plath which they would manage themselves. Their work consisted of collecting discarded materials from the homes and streets of their communities and sorting out the reusable items to sell to factories for use as raw materials. During the next 10 years, the cooperative grew to 44 members, all of whom came from poor backgrounds. Although the members of Oreste Plath benefitted from the coordination of their efforts, a lack of formal training restricted the expansion of the business. The members of Oreste Plath relied on makeshift mechanisms for transporting recycled goods, including shopping carts, strollers and handcarts. These methods of transport were physically tiring and limited the volume of material that Karina and the other collectors could carry. In 2009, Oreste Plath entered TechnoServe/Chile’s business plan competition Idea Tu Empresa with hopes of expanding and improving their business. They won first prize in the competition and were awarded $8,000 in seed money. Oreste Plath invested the seed capital in 22 large tricycles to be shared by the members of the organization. The tricycles help the members convey more weight than they could with handcarts, allowing them to increase the volume of material collected each day. In addition, TechnoServe trained the members of Oreste Plath in accounting and business management and helped them to develop a business strategy. They took classes in computing, administration and online communication. Since Oreste Plath began working with TechnoServe in 2009, sales have increased by 50 percent. The organization has gained 10 new members. Karina was recently invited to speak about Oreste Plath at international conferences in Bolivia and Peru. The cooperative has joined the national recyclers association where it has gained recognition as the only recycling center in Chile that is organized and operated by the recycling collectors themselves. Members of Oreste Plath now earn enough to support themselves and their families while contributing to a cleaner, more environmentally responsible community. The reusable materials they collect would otherwise end up in landfills or dumps, exacerbating waste management problems in the rapidly growing capital city of Santiago.